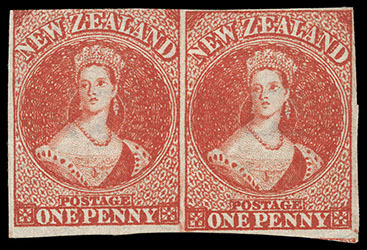 New Zealand, 1864, Queen Victoria "Chalon Head", 1d carmine vermilion, imperf., inverted "N Z" watermark, unused without gum, clear to large margins, vibrant color with strong impression, lower right corner crease, fresh and Very Fine appearance; with 1996 B.P.A. certificate. Scott No. 27 var. Campbell Paterson No. A1j var. SG No. 97 var. £950 as normal ($1,250). 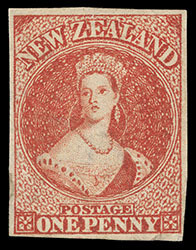 New Zealand, 1864, Queen Victoria "Chalon Head", 1d carmine vermilion, imperf, N Z watermark, unused without gum, full to large margins except left stamp touched at top due to irregular layout; deep radiant color, light horizontal crease, fresh and F.-V.F. appearance; with 1984 Ferchenbauer certificate. Scott No. 27. Campbell Paterson No. A1j. SG No. 97 £1,900 as singles ($2,500). 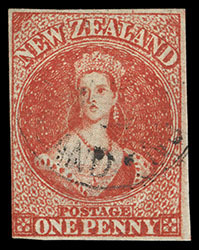 New Zealand, 1864, Queen Victoria "Chalon Head", 1d carmine vermilion, imperf, inverted "N Z" watermark, margins to barely touched at left, intense color on bright paper, light town cds cancel, F.-V.F. and scarce variety. Scott No. 27 var. Campbell Paterson No. A1j var. SG No. 97 var. £350 as normal ($460). 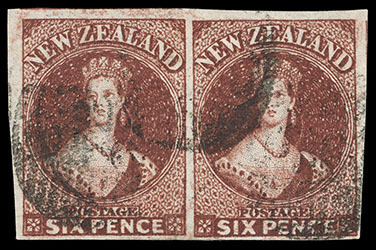 New Zealand, 1864, Queen Victoria "Chalon Head", 1d carmine vermilion, imperf, N Z watermark, strip of three with four mostly large to huge margins showing parts of stamps below, and single with huge margins all around, used with 6d red brown (122), s.e. 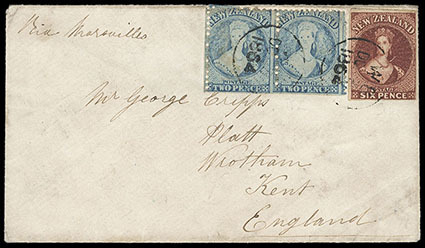 at right, all with vibrant color, tied by three bold strikes of "Headquarters" barred ovals, matching "New-Zealand, SP 1, 1864" double-arc backstamp on cover from Capt. S. Grace of 68th Regiment at Tauranga to London, England, endorsed "Via Marseilles" at top left, Auckland (9.5) transit cds and red London Paid (11.16) arrival cds; restored cover faults, lovely Very Fine appearance, H. Gordon Kaye, Christie's Robson Lowe, November 1991, lot 46. Scott No. 27. Campbell Paterson No. A1j. SG No. 97 Estimate $2,000 - 3,000. 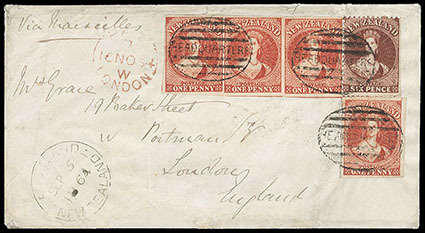 A REMARKABLE USE OF THE 1864 1D CARMINE VERMILION IMPERF ISSUE TO THE UNITED KINGDOM. 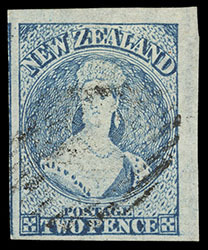 New Zealand, 1864, Queen Victoria "Chalon Head", 2d pale blue, imperf, N Z watermark, pos. R. 1/12 corner margin single with huge margins, bright color, light barred oval cancel, a Superb gem, a remarkable stamp; with 1991 Brandon certificate. Scott No. 28. Campbell Paterson No. A2j (1). SG No. 98 £275 ($360). 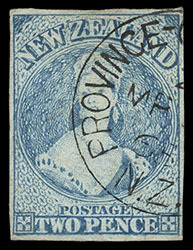 New Zealand, 1864, Queen Victoria "Chalon Head", 2d pale blue, imperf, Re-entry (R. 8/11), N Z watermark, four large margins, pretty bright color and paper, sharp town cds cancel, fresh and Very Fine. Scott No. 28 var. Campbell Paterson No. A2j (1) var. SG No. 98 var. £275 as normal ($360). Joseph Hackmey, Spink Shreves, February 2009, lot 1320; with 1988 Holcombe certificate. Scott No. 29. Campbell Paterson No. A5f. SG No. 99 £6,000 ($7,880). A STUNNING EXAMPLE OF THE 1864 6D RED BROWN IMPERF ISSUE IN OUTSTANDING CONDITION, CERTAINLY ONE OF THE FINEST KNOWN. 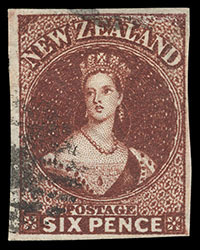 New Zealand, 1864, Queen Victoria "Chalon Head", 6d red brown, imperf, N Z watermark, large to extra margins, intense color and impression on bright paper, light face-free barred oval cancels, Extremely Fine and choice. Scott No. 29. Campbell Paterson No. A5f. SG No. 99 £700 ($920). Joseph Hackmey, Spink Shreves, February 2009, lot 1328. Scott No. 29. Campbell Paterson No. A5f. SG No. 99 £1,400 as singles ($1,840). THE ONLY RECORDED MULTIPLE OF THIS ELUSIVE STAMP. 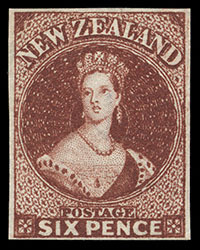 New Zealand, 1864, Queen Victoria "Chalon Head", 6d red brown, imperf, N Z watermark, full to large margins, rich color on bright paper, used with 1864, 2d pale blue, perf 12½ (107) horizontal pair, tied by "W 8, DC 3, 1864" cds of Whareama (Wellington Province) on cover to Wrotham, England, endorsed "Via Marseilles" at top left, reverse with Wellington (12.6) transit cds and Seven Oaks (2.16) arrival cds; cover soiling and wear, Fine and scarce imperf-perf combo franking; with 1985 B.P.A. certificate. Scott No. 29. Campbell Paterson No. A5f. SG No. 99 Estimate $500 - 750.